UK-based artist Anna Garforth experiments with all kinds of materials, but we are especially intrigued by her incredible moss graffiti that has appeared on walls as far afield as Hong Kong! A relatively new medium for street artists, moss grows easily and has none of the environmental detriments associated with conventional spray-painted graffiti. Plus, it looks phenomenal. Hit the jump for a closer look at a few of Anna's gorgeous moss graffiti projects. The Big Bang explosion of moss appeared at the Russian Club in the UK, which hosted the W Project – a celebration of female artists. 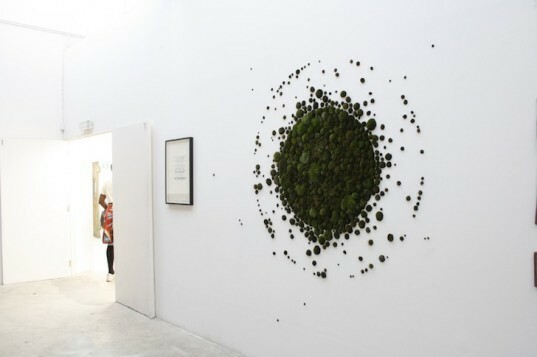 The circular patches of moss depict mother earth as a seed shattering explosion. 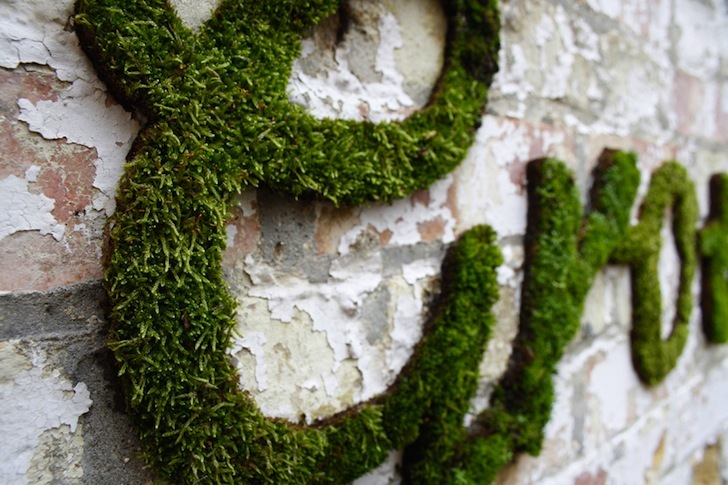 Her moss typology project, Grow, appeared on a wall in London that is slated for demolition. She won’t say where it is located exactly, but she wanted to express her appreciation for the existing urban wilderness before it is completely vanquished. Lastly, Moss Cross was created for the Urban Physic Garden, an urban community project by several architects, artists, and designers in the UK designed to promote nature and its healing properties. Moss, it turns out, is not just a cool new way to deck out empty walls, but it also has anti-bacterial properties and saved thousands of lives as a wound dressing in World War II! Keep an eye out for Anna Galforth… she has other groundbreaking projects up her sleeve that put her squarely en par with some of the greatest green graffiti artists out there. Unfortunately, I think you miss the point here. The 'Style' is that of a 'Graffiti artist', not stating that the art is in itself, is uninvited Graffiti. Point of fact, there are many 'Graffiti Artists' who started out as the typical 'Graffiti Punks', but due to the nature and skill of the pieces that they did, the property values actually increased, and these people were able to cross-over to legitimate artists. The problem is that many have something that they want to express but have very few actual outlets for them to do so. As with all things with practice comes skill and subtilty, unfortunately there are too few venues wher graffittists can express themselves without causing the very damage that you are talkning about. If there were venues that allowed them to practice, perhaps with non-toxic water based spray paints, (so they would have fresh surfaces after every rain) this might not be as much of an issue. In some cases, the artist might prefer the temporary nature of the graffiti that they aint with these paints. Perhaps this is too hopeful a thought, but it alsomight be a viable alternative. "Incredible moss graffiti" Wow, that is interesting stuff and it looks cool when it is authorized and invited, and in such instances, it isn't graffiti. Graffiti consists of unauthorized markings. People spend billions of dollars a year trying to stop graffiti, prevent graffiti, and remove graffiti. Anna Galforth has created some amazing art that was invited and authorized, and as such, it isn't "graffiti art". Those of us who follow http://www.DefacingAmerica.com view graffiti as destructive. Graffiti vandalism is very expensive to remove, and it devalues property by 15%. Let's stop graffiti. This moss design depicts mother earth as an explosion of seeds! Moss has anti-bacterial properties that saved thousands of lives in WWII as wound dressing!